Oxford, Maine - Timmy Brackett of Buckfield raced to his first Budweiser Championship Series Super Late Model victory of the season in Saturday's Irving Forest Products 50 at Oxford Plains Speedway. 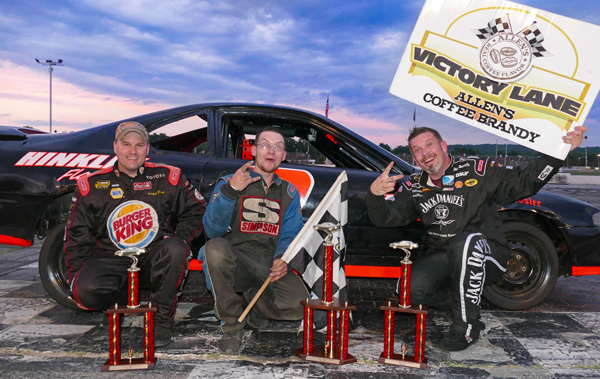 Brackett, the four-time and reigning track champion in the top class at Oxford Plains Speedway, had struggled in his role as defending champion until very recently. A good starting spot and winless 2017 campaign had earned him a pole starting position Saturday night, and he led every lap to post his first win of the season. Windham's JT Thurlow posted a career-best, second-place Super Late Model finish at Oxford Plains Speedway. Thurlow, clearly making steady progress with his Super Late Model program, made steady forward progress against top-notch competition in the 50-lapper. 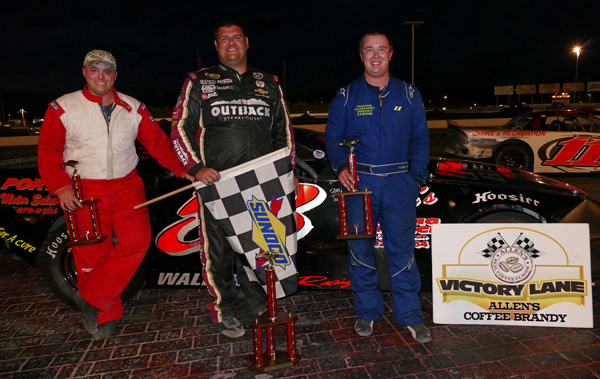 Multi-time Late Model track champion Shawn Martin of Turner started near the back of the back, went to the back of the lineup again when his shifter broke, then high-geared his way to an impressive third-place finish after winning the most recent Super Late Model 50-lapper. Oxford's own Dennis Spencer, Jr. bounced back from an early spin to finish in fourth place. Unofficially, Kelly Moore rounded out the top-five, just ahead of Buckfield's TJ Brackett. Spencer, Timmy Brackett and Winterport's Ryan Deane won 12-lap heat races. 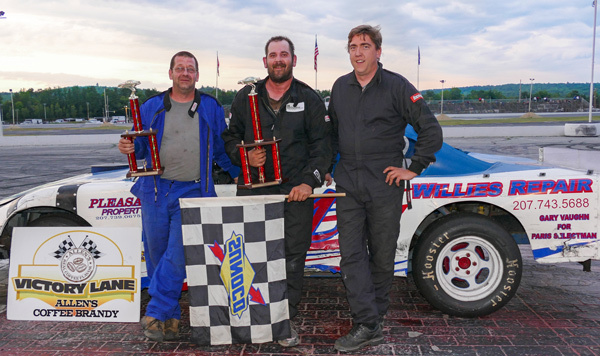 David Whittier of West Poland returned to victory lane in the 30-lap main event for Allen's Coffee Flavored Brandy Street Stock division competitors. Whittier prevailed in a spirited battle for the lead and eventual win versus Lisbon's Rick Spaulding, who led more than half of the finale. Livermore's Tyler King made a late charge up through the field to nail down runner-up honors in front of Turner's Matt Dufault, clearly working the wheel hard to claim his trophy and a third-place finish. Bryce Mains of Bridgton and Spaulding rounded out the top five. King won the heat race. Kyle Hewins of Leeds romped to victory in the 20-lap main event for the Bandits division. Hewins, filling in for former division champion Shaun Hinkley who was sidelined by a work injury, led the entire race. Adam Sanborn of West Paris, driving a car owned by race winner Hewins, cruised to another second-place finish. Reigning OPS Bandits Champion Jamie Heath of Waterford was closest to the front row starters as the checkered flag waved after passing cars in three different grooves to earn a third-place trophy. Tyler Jalbert of Auburn battled hard for his fourth-place finish, with Turner's Tyler Green filling out the top-five rundown. Hewins and Auburn's Brandon Varney won heat races for the four-cylinder class. Kyle Kilgore of South Paris got to the lead early in the 15-lap Figure 8 race and cruised to victory in a race that saw spins and spills aplenty well behind the winner. 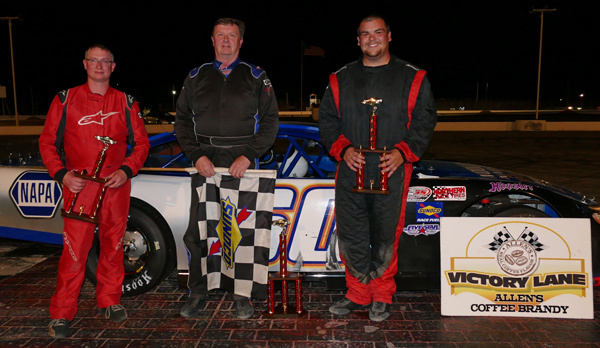 Greg Durgin of South Paris got his best-ever Figure 8 finish with a runner-up performance. The previous week's winner, Eric Hodgkins, claimed third-place hardware in survival mode. David Smith of South Paris and points leader Tommy Tompkins of Carthage rounded out the top five. Kilgore's only real threat was Lewiston's Jon Lizotte, who was eliminated by a car he owns. Peter Craig of Poland held off a stout challenge from Gray's Kevin Oliver to win the Legends Cars feature race. Massachusetts teen Aliyah Neale picked up the third-place trophy. The Budweiser Championship Series at Oxford Plains Speedway continues on Saturday, July 29 at 7:00 p.m., featuring the ultra-quick Super Late Models. The Speedway hosts the Pro All Stars Super Late Models on Sunday, July 30 at 5:00 p.m., with PASS Mods and Legends Cars also in competition. Oxford Plains Speedway is located at 877 Main Street, on State Route 26 in Oxford, Maine. For more information, please visit oxfordplains.com or call (207) 539-8865. Unofficial Budweiser Championship Series stock car racing results from Oxford Plains Speedway; Oxford, Maine; Saturday, July 22, 2017 showing finishing position, car number, driver's name, driver's hometown. 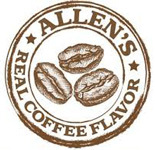 Allen's Coffee Flavored Brandy Street Stock (30 laps) 1 58 David Whittier, West Poland; 2 11 Tyler King, Livermore; 3 61 Matt Dufault, Turner; 4 77 Bryce Mains, Bridgton; 5 36 Rick Spaulding, Lisbon; 6 14 Anthony Constantino, Sumner; 7 33 Andrew Breton, Greene; 8 39 Drew Morse, Buxton; 9 09 Mark Turner, Norway; 10 1 Billy Childs, Jr., Leeds; DNS 4 Jordan Russell, Norway; DNS 35 Kristina Nadeau, Buxton. Bandits (20 laps) 1 2 Kyle Hewins, Leeds; 2 51 Adam Sanborn, West Paris; 3 91 Jamie Heath, Waterford; 4 04 Tyler Jalbert, Auburn; 5 26 Tyler Green, Turner; 6 21 Richard Kimball, Mechanic Falls; 7 1 Brandon Varney, Auburn; 8 95 Eric Stoddard, South Paris; 9 52 Chad Wills, Oxford; 10 3 Chachy Hall, Oxford; 11 5 Jacob Hall, Oxford; 12 36 Scott Jordan, Auburn; 13 15 Brian Hiscock, Turner; 14 56 Addie McDaniel, Bridgton; 15 77 Rob Crepeau, Minot; 16 24 Travis Verrill, South Paris; 17 71 Chris Foster, Lisbon; 18 23 Eric Parlin, Mechanic Falls; 19 55 Dean Jordan, Jay; 20 44 Tyler Libby, Auburn; 21 33 Matt Hiscock, Turner; 22 8 Josh Knoll, Mechanic Falls. Figure 8 (15 laps) 1 4 Kyle Kilgore, South Paris; 2 41 Greg Durgin, South Paris; 3 97 Eric Hodgkins, Mechanic Falls; 4 54 David Smith, South Paris; 5 113 Tommy Tompkins, Carthage; 6 40 Robert Morey, Lisbon; 7 2 Dale Lawrence, Lisbon; 8 27 Jon Lizotte, Lewiston. Legends Cars (15 laps) 1 4 Peter Craig, Poland; 2 28 Kevin Oliver, Gray; 3 14 Aliyah Neale, South Royalston, MA.